Need a little bit of a pick me up? We absolutely love this face and body scrub by Lush Cosmetics. 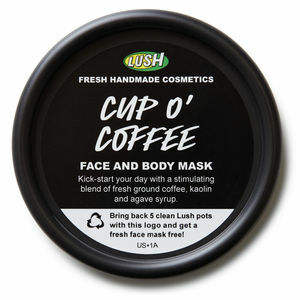 The Cup O’ Coffee ($10.95 – $19.95) face and body mask invigorates your skin and mind with the rich, intoxicating aroma of freshly brewed coffee and sweet roasted cocoa extract. The Kaolin ingredient deeply cleanses impurities from the pores and ground coffee acts as a gentle scrub to buff away dryness and reveal glowing skin beneath.